H.C. Westermann, Memorial to the Idea of Man If He Was an Idea, 1958. Mixed technique, 143 x 96 x 36 cm, Collection of Museum of Contemporary Art Chicago, Susan and Lewis Manilow Collection of Chicago Artists, 1993.34. 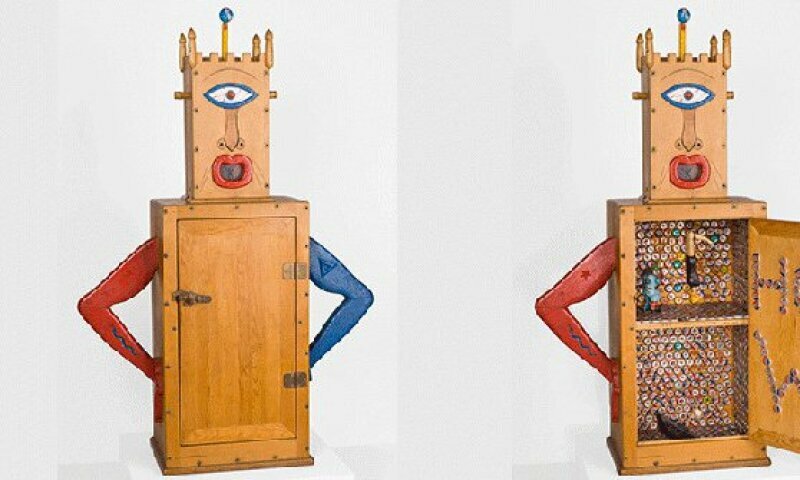 American artist Horace Clifford Westermann (Los Angeles, 1922 – Danbury, 1981) assembled a distinctive and singular body of sculptures. His works were predominantly made from wood through his masterly command of carpentry and cabinetmaking, yet he also used other techniques and materials such as metal, glass and enamelling with incredible precision. Without adhering to one particular style, Westermann was a maker of objects, of separate pieces: his sculptures, laden with meaning, often irony, result from the processing of experience, coalescing to yield specific fragments of reality.